Antidepressants are used to treat, relieve, and prevent psychiatric depression. When used with exercise, different physiologic responses can occur. There are many types of antidepressant medications that can be effective at reducing depressive symptoms in patients. The main classifications this article focuses on are serotonin reuptake inhibitors (SSRIs), norepinephrine and dopamine reuptake inhibitors (NDRIs), tricyclic antidepressants (TCAs), Serotonin-Norepinephrine Reuptake inhibitors (SNRI). TCAs were some of the initially marketed antidepressant medications in the 1950s and 1960s. They are still prescribed to certain individuals, however, they can often produce serious side effects and for the most part, have been replaced by newer antidepressants. SSRIs and NDRIs are commonly prescribed antidepressant medications. They inhibit the reuptake of serotonin and norepinephrine/dopamine, respectively, allowing the neurotransmitters to stay in the synapse for a longer period of time. While these are some of the main types of antidepressant medications, some of the articles cited in the topics below may include other types of antidepressants as well. The effects of antidepressants on individuals with high or low aerobic capacity can be assessed to evaluate the time to fatigue. Research was performed on Paroxetine, an SSRI, to determine its relationship to fatigue. Fatigue can be caused by a higher ratio of serotonin to dopamine in the brain, producing lethargy and lack of motivation. A specific dosage of 20 milligrams of Paroxetine caused a decrease in total time of exercise until fatigue and performance in the individuals with higher aerobic capacity, which makes these individuals more responsive to the activation of serotonin than the low aerobic capacity group. Therefore, SSRI medication may influence time to fatigue and exercise performance in individuals with high aerobic capacity. However, because of the variability of outcomes with dosage amounts, more research is needed for results to be accepted as conclusive. •Caution: Although Maprotiline showed an increase in HSS Gait and BI, patients who took a placebo drug with rehabilitation had greater improvement than those who took Maprotiline with rehabilitation. Therefore, Maprotiline may hinder rehabilitation. •Conclusion: "It was concluded that venlafaxine could modulate the cortical excitability and improve finger dexterity and reaction speed, which greatly related to the increase of contralateral motor cortical excitability." TCAs were the classic antidepressant medication for decades before SSRIs were discovered. TCAs are now known to be potentially toxic to the cardiovascular system. With normal therapeutic doses, hypotension is not uncommon. This is extremely relevant for physical therapy as hypotension can make a patient at-risk for falls and/or fractures. In cases of overdose, TCAs can cause fatal arrhythmias. While TCAs are still prescribed to certain individuals, they have mostly been replaced by SSRIs, NDRIs, and other antidepressant medications. These newer medications have proven to be just as effective in terms of relieving the symptoms of depression, but they have far fewer negative side effects than their earlier counterparts. Paroxetine is a commonly prescribed SSRI. A 1992 article from International Clinical Psychopharmacology discussed two randomized controlled trials (RCTs) concerning paroxetine. Both RCTs were double blind studies. The first study concerned the effects of paroxetine in patients diagnosed with clinical depression. The results showed that paroxetine did not significantly alter heart rate, blood pressure, or EKG variables in the experimental group. The second study compared paroxetine versus amitriptyline (a TCA) in healthy males. The results showed no effect on EKG, heart rate, or blood pressure in those who received paroxetine. Those who received amitriptyline showed increased heart rate (p<.05) and changes in EKG variables. QT interval prolongation can cause ventricular fibrillation, leading to sudden cardiac arrest. A cross-sectional study of 38,397 adults revealed an association between antidepressants and QT interval prolongation, particularly citalopram. Other studies observed the same association. A 2014 study explained that non-SSRI medications do not appear to cause QT interval prolongation at therapeutic doses, but few controlled studies exist. Among the SSRI’s, “paroxetine appears to have the lowest risk,”. Due to these risks, the FDA changed the maximum dose of citalopram to 40 mg per day . The maximum dose for patients older than 60 or patients with additional risk factors is 20 mg per day. Anti-arrhythmia drugs and some antibiotics can also cause QT prolongation, so patients should not take these drugs in combination with antidepressants. Cardiovascular factors must be considered when evaluating a person's ability to exercise in a healthy manner. Studies show that while cardiovascular effects may have been a concern in the past, they are now considerably less of a factor with the most commonly prescribed antidepressants. SSRI use can also impact the pulmonary system. Although past research suggested that these medications may have protective pulmonary benefits, a 2012 case-control study concluded that SSRIs do not reduce the risk of developing pulmonary arterial hypertension (PAH). This case-control study matched ten subjects with controls. The subjects were individuals who developed PAH that required treatment with medication. The two groups were either exposed to SSRIs or non-SSRI antidepressant medications. The results of this study contradicted their hypothesis that SSRIs would prevent PAH, in fact a positive association was found between individuals who used SSRIs and the development of PAH. The effects antidepressant medications have on the metabolic system vary widely depending on the individual and the type of medication used. Some of the most common metabolic side effects are weight gain and weight loss. Research has shown that TCA’s and many SSRI’s share the common side effect of causing weight gain. However, some SSRI’s have actually shown to have the exact opposite effect, depending on the specific SSRI used and on the individual. NDRI’s have also shown to have the exact opposite effect, and have even been successfully used for the explicit purpose of increasing metabolism to lose weight. One specific NDRI drug that has become especially popular for its weight loss effects is Bupropion, widely known by the brand name Wellbutrin. It is therefore of the utmost importance to note the type of antidepressant medication patients are using when attempting to gain or lose weight through an exercises program. Parkinsonism involves tremors like those that are seen in Parkinson’s disease, as well as rigidity and trouble controlling voluntary movements. Acute dystonia is characterized by the full contraction of a muscle and results in postural problems, especially through the neck. Akathisia is associated with continuous lower extremity movement, such as pacing. This type of extrapyramindal syndrome also has an anxiety component, where patients report feeling uneasy. Serotonin toxicity a.k.a. serotonin syndrome: a result of “excessive serotonergic transmission within the central nervous system." Symptoms: “altered mental state, neuromuscular hyperactivity, and autonomic hyperactivity." agitation, confusion, tremors, muscle spasms, and tachycardia. An article by Gillman indicates that research shows this condition is caused by combinations of drugs. If this condition is not caught, it can lead to death. These conditions, along with others, could potentially interfere with interventions and cause exercising to be more difficult. If patients are experiencing any symptoms related to these conditions, it is important to screen their medications to see if that may be the cause. While discussing the influence of antidepressant medication on exercise we must determine how this applies to physical therapy. One syndrome that is managed with both antidepressants and exercise under the care of a physical therapist is Fibromyalgia. Fibromyalgia is a disease that is associated with chronic musculoskeletal pain and/or inflammation that affects 10-12% of the population . According to a clinical review conducted by Goldenberg, D., Burckhardt, C., and Crofford, L. (2004), the best treatment for Fibromyalgia is a stepwise program including education, medication, and exercise. These education and exercise aspects of the program can be performed by a physical therapist during a physical therapy session and the prescription of medication can be recommended to a physician by a physical therapist. The pharmacotherapy portion of the multidisciplinary treatment includes a low-dose tricyclic antidepressant medication, such as amitriptyline or cyclobenzaprine. In another study by Ozerbil, O., Okudan, N., Gokbel, H., and Levendoglu, F. (2005), the authors found that fluoxetine also had a positive impact on anaerobic exercise in female patients with fibromyalgia, specifically . Treating patients with fibromyalgia may include these types of antidepressants to help with pain control; however, if a therapist recognizes any adverse effects on exercise, then antidepressant medications should be avoided or reconsidered by referring the patient back to the prescribing doctor. The exercise portion includes cardiovascular, aerobic, and muscle strengthening activities. In the review by Goldenberg et al. (2004), the authors found an improvement in pain of 17.1% in the exercise group versus a .5% in the control group . This indicates that the third aspect of the program, exercise, is essential in the improvement of pain control of those individuals with Fibromyalgia Syndrome. Ozerbil et al. (2005) also discovered the benefits of fluoxetine and amitriptyline on anaerobic exercise in female patients with fibromyalgia, overall, benefiting the quality of life of these patients . Physical Therapy can play an integral part in the management of FMS along side antidepressants through education and exercise prescription. Electrocortical and Biochemical Evaluation of Antidepressant Efficacy of Formulated Nanocurcumin. ↑ Ramachandraih CT, Subramanyam N, Bar KJ, Baker G, Yeragani VK. Antidepressants: from MAOIs to SSRIs and more. Indian J Psychiatry. 2011;53(2):180–2. DOI:10.4103/0019-5545.82567. ↑ Healthline. Common Depression Drugs and Medications. http://www.healthline.com/health/depression/drugs-medications#Overview1 (accessed 2 Dec 2015). ↑ Coelho M, Serafim A, Suares D, Teixeira-Coelho F, Uendeles-Pinto J, Wanner S. The paroxetine effect on exercise performance depends on the aerobic capacity of exercising individuals. J Sports Sci Med. 2014;13:232-43. ↑ 4.0 4.1 Dam M, Tonin P, De Boni A, Pizzolato, G, Casson S, Ermani, M, et al. Effects of fluoxetine and maprotiline on functional recovery in poststroke hemiplegic patients undergoing rehabilitation therapy. Stroke 1996;27:1211-4. ↑ 5.0 5.1 Berends HI, Nijlant J, Van Putten M, Movig KL, Ijzerman MJ. Single dose of fluoxetine increases muscle activation in chronic stroke patients. Clinical Neuropharmacology. 2009;32(1):1-5. ↑ 6.0 6.1 6.2 Adams HP, Davis PH, Jang M, Jorge RE, Leira EC, Mikami K, Robinson RG. Effect of antidepressants on the course of disability following stroke. American Journal Geriatric of Psychiatry 2011;19(12):1007-15. ↑ 7.0 7.1 Han LX, Li CY, Li YK, Liu FD, Liu Y, Song XZ, Wang J. The effects of venlafaxine on cortical motor area activity in health subjects: A pilot study. Journal of Clinical Psychopharmacology 2014;34(1):93-98. ↑ 8.0 8.1 Warrington SJ, Lewis Y. Cardiovascular effects of antidepressants: studies of paroxetine in healthy mean and depressed patients. Int Clin Psychopharmacol. 1992;6(4):59-64. ↑ 16.0 16.1 Dhalla IA, Jurrlick DN, Gomes T, Granton JT, Zheng H, Mamdani MM. Selective serotonin reuptake inhibitors and pulmonary arterial hypertension: a case control study. CHEST 2012;141:348-53. Full version: http://journal.publications.chestnet.org/data/Journals/CHEST/23327/110426.pdf (accessed 19 Nov 2015). ↑ Papakostas GI. Tolerability of modern antidepressants. J Clin Psychiat 2008;69:8-13. 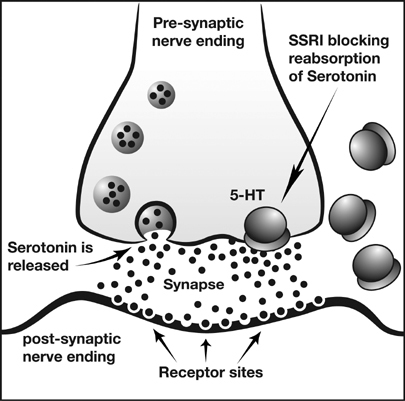 ↑ Masand PS, Gupta S. Selective serotonin-reuptake inhibitors: an update. Harv Rev Psychiatry. 1999;7(2):69-84. ↑ Pijl H, Meinders AE. Bodyweight change as an adverse effect of drug treatment. Mechanisms and management. Drug Saf. 1996;14(5):329-42. ↑ Gadde KM, Parker CB, Marner LG, Wagner HR, Logue EJ, Drezner MK, Krishnan KR. Bupropion for weight loss: an investigation of efficacy and tolerability in overweight and obese women. Obes Res 2001;9(9):544-51. ↑ Jain A, Kaplan R, Gadde K, Wadden T, Allison D, Brewer E, . . . Metz A. Bupropion SR vs. placebo for weight loss in obese patients with depressive symptoms. Obes Res 2002;10(10):1049-56. ↑ Anderson J, Greenway F, Fujioka K, Gadde K, Mckenney J, O'neil P. Bupropion SR enhances weight loss: A 48-week double-blind, placebo-controlled trial. Obes Res. 2002;10(7):633-41. ↑ 26.0 26.1 26.2 Haddad PM, Dursun SM. Neurological complications of psychiatric drugs: Clinical features and management. Human Psychopharmacology 2007;23:15-26. ↑ Gillman KP. A review of serotonin toxicity data: implications for the mechanisms of antidepressant drug action. Biol Psychiatry. 2006;59:1046-51. ↑ Croft P, Rigby AS, Boswell R, et al. The prevalence of chronic widespread pain in the general population. J Rheumatol. 1993;20:710-13. ↑ Goldenburg D, Burkenhardt C, Crofford L. Management of fibromyalgia syndrome. JAMA. 2004;292(19),2388-95.